Just wanted you to know that I appreciate you sharing your time and especially your love of stamping. Your ideas are great and I do CASE alot of them. Love these ideas! You're chock-full of them! I adapted your Owl Key Chains as rewards for over $50 in orders at my Open House yesterday -- I sold 3 owls because of it! Thank you so much again! Super cute. I just absolutely love your work and your blog. Thank you so much for all your hard work and time to share with me! Adorable!! Are you back to making teacher appreciation gifts already!! LOVE IT BECKY! Love these book marks Becky!! They are so cute. Can I CASE them for my upcoming Aviary class? Awesome! I don't need a creative bone in my body - you've got it all, girl! Another fabulous idea I'll be CASE-ing soon. You are always so creative. I just love your stuff. Keep creating. HI there! Love the bookmark!!! How did you get the book mark to have the scalloped edge on top? I am not sure I understand how you did it. Also, how did you get the stitching on it? Did you paper pierce the whole thing or did it come out of the big shot like that? I love it!!!!!! thanks for indulging my goofy questions. 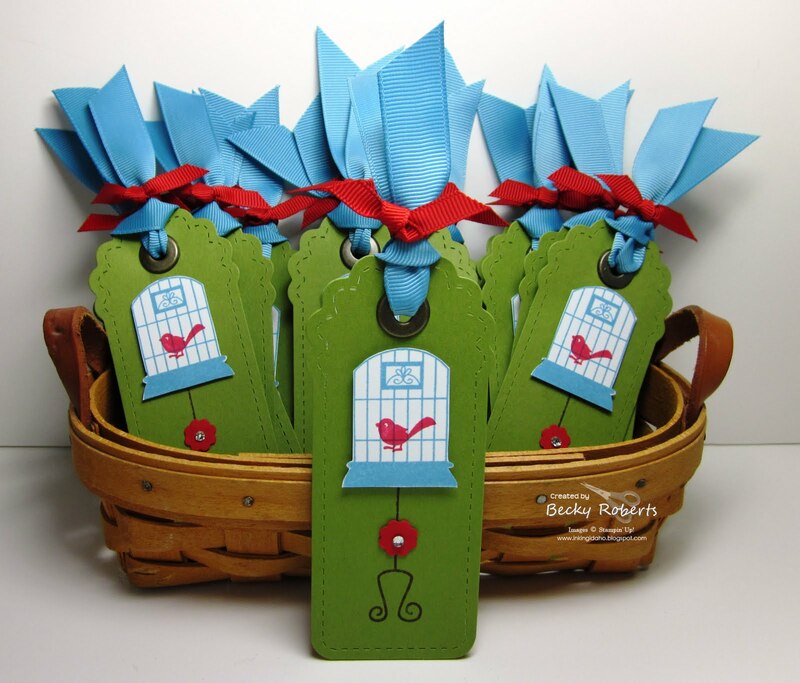 Becky I love Your Birdhouse Bookmarks I want say Thank you for sharing all your post with us it's very inspirational and encourging. I case a great deal of the ideas you share, especially the purses, but some ideas take more time than others. I do appreciate the time you take to share these.Thank You again you are an awesome lady.